With the release of the sixth season of Friends, the series officially crosses the midway point. Assuming that the show really does go off the air following then conclusion of its tenth season, we now have more than half the programs on DVD. Aired during 1999-2000, I’ll offer brief discussions of all the episodes, listed in their broadcast order. The synopses mostly come straight from the package’s liner notes. As a helpful guide, an asterisk denotes shows that also appeared on any of the prior “best of” DVDs that Warner Bros. released before they came to their senses and started to package Friends in season sets. As usual, the Ross/Rachel dynamic provides the show’s most entertaining moments. Ross’s pathetic attempts to avoid becoming “Divorce Guy” offer some fun bits and make the show more memorable. As usual, the Chandler/Monica parts come across as the worst. Those elements swerve into soap opera territory, and the attempts to have “signs” tell them to get married become lame. Overall, the episode is good but unexceptional. ”Hugs” offers a good program, though not one that stands out in a particularly compelling way. It furthers a couple of important character threads in a reasonably innocuous manner and offers some funny bits, mostly related to Ross’s issues connected to another failed marriage. Desperate Ross is pathetic Ross is funny Ross. This means “Denial” generates some good moments as sad-sack Ross tries to deal with his feelings. Although I don’t normally find much amusement from Chandler/Monica, their argument about the room brings us a few entertaining bits, as does Joey’s quest for a new – hot and female – roommate. Overall, “Denial” offers a pretty solid show. Though I generally feel disdain for soap opera elements, when they involve the Ross/Rachel dynamic, they usually work, and that occurs here. They bicker endlessly, much to the show’s success. Some lame cutesy bits with babies cause the program to drag at times, but it still works fairly well. Conflict equals comedy, which makes “Night” very amusing. Rachel and Monica fight about each other’s flaws as roommates, and the show takes off into hilarious antagonism. Chandler’s desperate attempts to slip Joey money also seem fun, and these help make “Night” a good episode. Though moderately amusing, the bits with Phoebe feel a little too much like they steal from the Seinfeld in which Elaine dances. Happily, the Joey moments make up for these, as he runs the gamut of emotions in regard to Janine; LeBlanc pulls these off with hilarious results. The scene in which Ross and Chandler realize all the ways they repel women also works nicely. The subplot about Ralph Lauren seems silly and doesn’t really go anywhere. However, we get to see pathetic Ross on a pathetic date, which always offers good material. In addition, although Elle Macpherson can’t act a lick, Joey’s parts provide some funny bits as he fears turning girlie. I’ll be happy when Janine gets the boot, as her presence turns Joey sappy. Nonetheless, “Routine” offers some good material, particularly connected to Ross and Monica. Their nerdy delight over appearing on the TV show and their behavior their makes the episode work. Happily, “Table” ends our time with Janine, though it seems illogical that she just now realizes she doesn’t like Monica and Chandler. Still, it gets rid of Macpherson’s dull presence from the show, so I won’t complain. The “B”-plot with Phoebe and Rachel seems amusing but predictable. “Table” manages to be a decent but unexceptional episode. Chalk up “Joke” as another pretty ordinary episode. Some good moments come from the conflicts between the girls when they argue about each others’ personalities. However, the issues about the joke seem surprisingly lackluster, and Joey’s acquisition of the new job doesn’t add much. After the blandness of Macpherson, it’s good to get a guest star with a personality. Witherspoon does nicely as Jill, and she and Aniston interact with real chemistry that makes the new character work. In addition, we get a rare funny subplot with Chandler and Monica. Their elements usually go sappy, but it’s funny to watch Monica’s denial and need for control. Though the Jill thread ends with some sappiness, it still seems pretty solid. The Phoebe subplot also adds some laughs, especially when she figures out how to fix the situation. Only the Chandler element falls a bit flat. Once again the Chandler and Monica parts seem pretty flat, as they go down a predictable path. The Ross parts aren’t all that hot either, and the Joey subplot fails to live up to expectations. The show musters some laughs but seems a bit subpar overall. The Ross subplot turns into an interesting one, especially as it offers the chance for a number of different possibilities. The fire also brings us some good comedy since the girls find themselves in competition over where to stay for different reasons. It’s a generally good episode. It doesn’t get much worse than clip shows, though “Mac” pulls it off acceptably well. The plot with Joey’s attempts to get the role creates some interesting moments. Nonetheless, it remains what it is: a cheap conglomeration of snippets from prior shows, so it’s the weakest episode of the season. “Dad” suffers from Big Guest Star-itis. Willis seems like a bad match for the series, as he comes across as a little distant and doesn’t fit well in the part, at least not so far. It’s funny to see Joey go through problems with the robot, but otherwise this is a pretty lackluster episode. Although I like Willis, I don’t care for him here, and I look forward to his departure. The whole shenanigans at the cabin feel like a lame episode of Three’s Company and don’t work very well. Joey’s attempts to get his picture back on the wall of his dry cleaner offer some humor, but this episode seems a little flat overall. Happily, “Ring” marks the end of Willis’s stay on the series, and he goes out with a plop. The rest of the show emphasizes soap opera elements, as Chandler struggles to get a ring. Other than Phoebe’s funny haggling at the jewelers, this one falls flat. “Proposal” often felt more like a soap opera than an episode of Friends, though I thought it handled the Chandler/Monica/Richard triangle reasonably well. The show indulged in more pathos than we ever would have seen during Seinfeld, but it popped enough comedy into the emotional moments to keep it from becoming insufferable. The Joey bits were easily the funniest, though, and the scenes at the charity event made the episode good. It seemed too hung up on the relationship bits to be tremendously good, but it still appeared to be a fairly solid program. Friends: The Complete Sixth Season appears in an aspect ratio of approximately 1.33:1 on these single-sided, double-layered DVDs; due to those dimensions, the image has not been enhanced for 16X9 televisions. Fans shouldn’t expect anything different here when compared to prior seasons, as year six offered virtually identical visuals. As usual, sharpness seemed somewhat inconsistent. Most of the time I felt the shows came across as reasonably detailed and distinctive. Unfortunately, more than sporadic examples of softness occurred, and the shows looked somewhat ill defined at times. Occasional examples of jagged edges and moiré effects occurred, and I also noticed some edge enhancement. Though the shows could come across as rather grainy at times, no other instances of source concerns appeared. As usual, the remastered Dolby Digital 5.0 soundtrack of Friends presented a satisfactory but unexceptional affair. Given the talky nature of the series, though, this remained no surprise. Dialogue dominated the episodes and remained oriented toward the front center. As always, music presented solid stereo presence over the front speakers, and the surrounds echoed the tunes moderately. Otherwise, the mix mostly remained monaural, as effects gently provided ambience and very little else. Once again audio quality was fine but not spectacular. Some light edginess occasionally affected speech, but most of the lines seemed concise and fairly natural. Effects played such a minor role in the shows that I found it hard to judge their quality. They seemed acceptably accurate, but they never taxed the track at all. At least no problems occurred with those elements, and the music came across as pretty bright and bouncy. The rock-oriented score sounded clean and distinct, and bass response was tight and fairly rich. As with previous years, Season Six sounded fine but did nothing to stand out as particularly strong. Unsurprisingly, the supplements found on these DVDs seem similar to those on prior sets. Most show up on DVD Four, but we get a few bits on the others as well. As already noted, many of the episodes themselves include bonus footage. The amount of new material varies from show to show, and based on the running times, it appears that some of the shows include no extra footage. I don’t know Friends well enough to recognize the new shots, but I think it’s cool that we get the uncut programs. Three audio commentaries appear. One appears on Disc Two via “The One Where Ross Got High” and another is on Disc Three’s “The One That Could Have Been”. 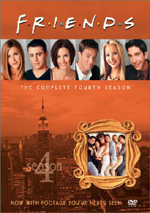 The final commentary goes alongside DVD Four’s “The One with the Proposal”. We hear from executive producers Kevin S. Bright, Marta Kauffman, and David Crane. All three were recorded separately for these tracks, and the results were edited together. Some of the remarks related directly to on-screen activities, but most dealt with general issues. Folks who heard the prior commentaries will know what to expect here. The participants cover a mix of topics related to the series. We get some notes about the specific episodes themselves, and we also hear about general issues that deal with the show. “Proposal” provides the best of the three tracks, mainly because it delves heavily into the challenges of developing the Chandler/Monica relationship and that subject’s issues. Although I’ve generally enjoyed prior Friends commentaries, these seemed spottier than usual. They presented more dead air than I recalled, and they also offered an awful lot of general praise. They still gave us some decent insight into the series, but they appeared somewhat flat much of the time. Moving to DVD Four, Friends of Friends provides some information from a few guest actors. The 12-minute and 28-second featurette intersperses show clips and interviews with Elliott Gould, Christina Pickles, Maggie Wheeler and Jane Sibbett. They discuss their roles, working on the series, and fitting in with the main cast. Much of this seems fairly bland and generic, though Wheeler offers nice notes about how she developed the character of Janice. Nonetheless, this remains a pretty lackluster program. Expect the usual material from the Gag Reel. This nine-minute and 30-second compilation shows the standard goofs and giggles shot during Season Six. It becomes pretty tedious and doesn’t offer much of interest. Hosted by actor James Michael Tyler, Gunther Spills the Beans offers a preview of Season Seven. This 82-second clip is literally nothing more than a teaser for the next DVD set. It provides nothing more than an ad. Next up is a quiz. Casino Challenge splits into three smaller games. “The One with the Cards” requires you to play a form of blackjack based on trivia questions about the shows; you need to select the appropriate characters who fit the criteria. “The One with the Wheel” suffers from an awkward interface but becomes a challenge as it forces you to pick from a number of potential answers to queries. “The One with the Slots” features more multiple-choice questions. The items vary in difficulty and reward long-time and attentive viewers. The various games are fairly fun, but you get an annoying reward for successful completion; we find a 58-second clip of fans who re-enact some of the series’ lines. 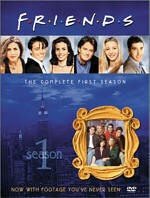 By the series’ sixth season, Friends was a well-oiled machine, and the show achieved a high level of consistency. We see that in this set, where we can watch many good programs and only a few moderate disappointments; unlike some earlier seasons, virtually none of them offer true duds. The DVDs demonstrate picture and audio quality that seem identical to those observed in prior packages, and the extras also come across as similar. That means another recommendation, as Season Six of Friends packs a lot of entertainment for the bucks.